Yu Haibo was in Switzerland for a few days in late May. 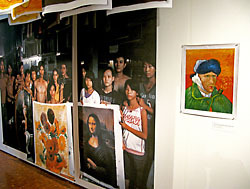 His photographic project Dafen Oil Painting Village was part of Die Kunst des Verfälschens (The Art of Faking), an exhibition presented at the Ethnographic Museum in Zürich, which showed how China has copied, imitated and forged its own artifacts throughout all periods in history. Modern times are no exception. 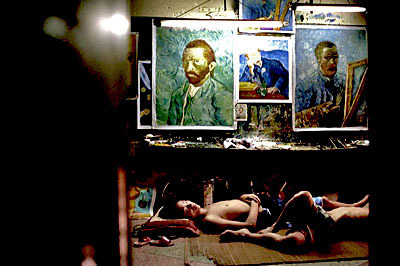 In 2005, Yu Haibo embarked on the incredible story of documenting art migrants who produce 60% of the world’s reproductions of famous oil paintings. Here we have a process by which Yu Haibo takes photographs of people who are reproducing artwork while he reproduces in his photographs the mentality and the soul of the crafsmen. This is what most impressed Mareile Flitsch, the director of the Ethnographic Museum of Zürich and a sinologue herself. 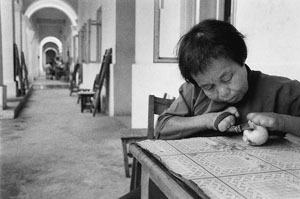 She recalls the moment Yu Haibo’s photographs came out of the fax machine. The images unscrolling on the machine slowly unveiled the intensity in the eyes and the posture of the subjects. Van Gogh is very popular in the world’s households. On the different websites that Dafen village has developped, one can buy The Man with a Pipe for $40. The reproduction, or should we say one of the reproductions, was hanging on the wall of the Ethnographic Museum of Zürich. The artist, Zhao Qiyong, painted it in 2010. The original dates back to 1889. A natural question would be to ask which art school had trained Zhao Qiyong. Even if the work was done quickly, and still smells of fresh paint, the technique is impressive. So, it is surprising to learn that the artist never went to any art school. « Everybody paints in his family. His younger brother, his wife, » explains Yu Haibo. « They all paint Van Gogh because it is quick. There is also an economic reason because many people like Van Gogh. » The fastest workers in Dafen can paint up to 30 paintings a day ! According to an article published in the German magazine Der Spiegel in 2006, an artist in Dafen will make between $128 and $385 a month. That makes quite a lot of reproductions a day at $0.45 per copy! 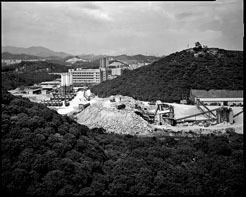 When the 27-year old Yu Haibo decided to settle down in Shenzhen in 1989, the town was already showing promise. Shenzhen was part of the Special Economic Zone created by Deng Xiaoping in 1980. Back then, this former fishing village located at the doorstep of Hong Kong had a population of roughly 20.000. Today Shenzhen has 13 million people. Deng Xiaoping’s Great Urban Leap has succeeded. The Great Economic Leap is more problematic. Yu Haibo was greatly affected by the conditions under which people lived at that time. He comes from Henan, a province very rich in history but also vey poor, with enormous social problems. Coming to a small place like Shenzhen at the end of the 1980s, was a deliberate choice. The nearness to Hong Kong was an economic and intellectual driving force for the people there. Yu Haibo found books on western art. 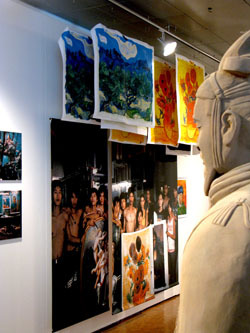 Ironically, he was exposed to more western art printed in books and magazines than his previous experience with classical Chinese art. Already in 1988, Yu Haibo began showing his instinctive inclination for surrealism. 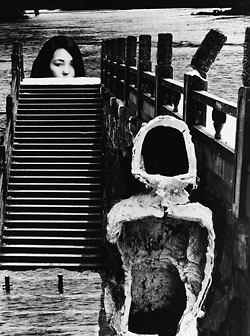 On the Other Shore, a series of black and white photographs/collages, allowed him to treat his frustrations and hopes in a more abstract way. 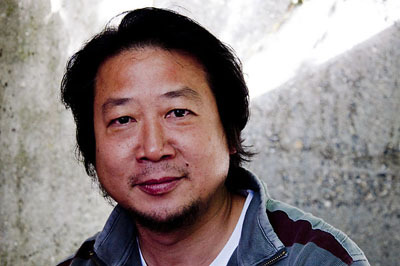 Yu Haibo felt a distance between himself and traditional Chinese painting. His resonance was more with the freedom that a camera could give. He also found possibilities and freedom by reading western philosophy. Yu Haibo immediately felt the dichotomy and wanted to capture it in his photographs. But the life of an artist was hard, so he started to write for an economic newspaper based in Hong Kong. Later, he would quit the paper and go to work for the Shenzhen Economic Daily. Writing and photographing for an official newspaper made it possible to meet people at different social levels. Today, Yu Haibo is the Chief Press Photographer for the Shenzhen Economic Daily and he is also the director of the Shenzhen Professional Photography Association. Yu Haibo has an ethnographic approach to the city of Shenzhen. Breath of Night is a portfolio that captures the thundering energy of the city’s youth. China’s Urban Expansion narrates the surgical effect on the landscape of the destruction of farmlands. The Last Days sensitively recounts the daily life of leprosy patients. 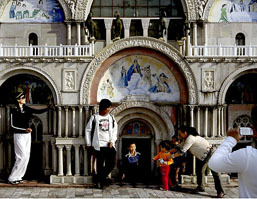 China’s Global Village shows how Chinese tourists naïvely participate in a conversation with the world. But, beyond the categorization, Yu Haibo asks profound questions about the definition of life. The people he meets are either extremely rich or extremely poor. « What are their dreams ? » the photographer asks. « Rich people are more and more busy with a materialistic dream. Shopping has become one of their favorite occupations. People want to live better. What is in the psyche of people ? Life conditions between rich and poor are fundamentaly different but the search for happiness and the realization of dreams are identical. » The depiction of the individual story, of the individual dream, is what makes a photograph and cements the portfolios together. It may be one of the reasons why Yu Haibo is now documenting what is becoming the future of the city of Shenzhen. 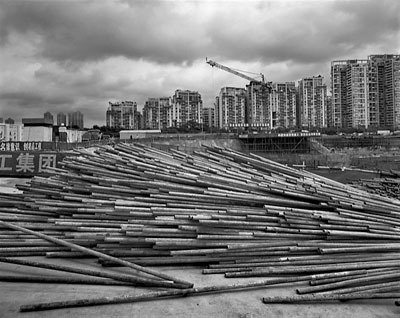 The project China’s Urban Expansion shows building sites outside of the city. This on-going documentation reveals more a moment in time than the actual construction. « The site is there, we can see it every day but the moment happens only time to time. Workers are there for a certain time and then the building site takes a different life when they leave. » The black and white photographs reveal the strangeness of material elements which, when incorporated in the global construction, won’t have their primal definition any more. They are brought on site as pieces of a deconstructed puzzle. As such, they become abstract. The construction site is irrelevant in a sense like people who are not pursuing a dream anymore but feed the system. We are greatly indebted to Yu Haibo who came especially to Geneva to share his vision about life and photography with us. We are also grateful to Yuan Li who did more than translating the interview. With charm and grace she added her questions and curiosity to the conversation. Finally, we would like to thank Dr. Mareile Flitsch, director of the Ethnographic Museum in Zürich as well as Dr. Xiujie Wu, guest curator at the same institution.